Few things bring Star Trek fans more excitement—and also anxiety—than the debut of a new Trek series. I wasn't old enough to grasp how big of a deal The Next Generation was when it premiered in 1987, brazenly introducing a Shakespearean, English actor to fill the captain's chair previously held by William Shatner. But by 1993, when Deep Space Nine debuted, I was a full-blown Trekkie. I remember a rollercoaster of emotions as I watched the Enterprise depart DS9 during the first episode, leaving an unfamiliar cast to fend for itself on the edge of Federation space. By the end, I was hooked, and to this day I maintain Deep Space Nine was underrated, with some particularly phenomenal episodes later in the series. I didn't get to see Voyager start in 1995 because our local cable provider didn't carry UPN, the United Paramount Network. I settled for reading fan magazines and listening to the soundtrack on CD, before I was finally able to catch up later in the series. Six years later, when the prequel Enterprise premiered, I found the concept exciting. Admirals wearing ties! Klingons in Oklahoma corn fields! Neptune and back in six minutes! My enthusiasm quickly fizzled once the opening credits played. No cool montage showing humanity's progression in space was enough for me to forgive the choice of "Where My Heart Will Take Me" for the theme song. Sixteen years later, all of this was in my mind as I sat down to watch the sixth and latest Trek series, Star Trek: Discovery. Any attempt to build on the Star Trek franchise is sure to be met with fans' scrutiny, and on top of that, this is another prequel, fitting in the Trek timeline after Enterprise but before the original five-year mission of Kirk and Spock. In today's nostalgia-saturated culture, it will be quite a challenge for CBS to make Discovery a good television show, a good sci-fi show, and last but not least, a good Star Trek show. I would, however, argue this is the most opportune time for a new Star Trek series since the original show debuted in 1966. Kirk and Spock hit the airwaves during the height of the Vietnam War, amid civil rights protests and the assassination of Martin Luther King, Jr. Today, with the world seemingly more divided than ever, what better time for a show originally dedicated to a Utopian vision of humans exploring the galaxy? 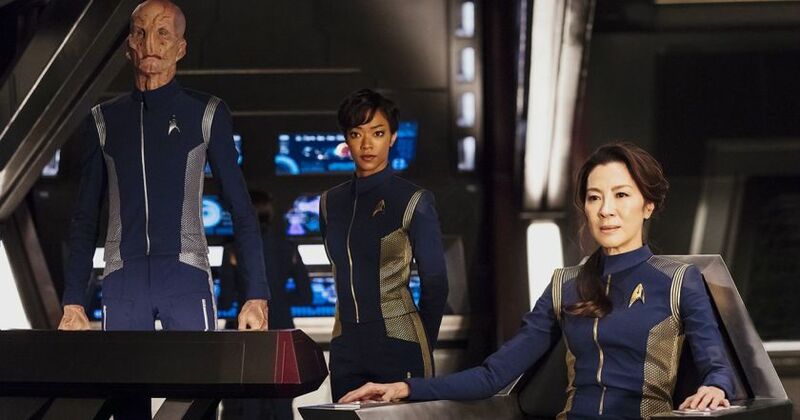 From left: Science officer Saru (Doug Jones), first officer Michael Burnham (Sonequa Martin-Green), Captain Philippa Georgiou (Michelle Yeoh). Discovery debuted Sunday night with two episodes: The Vulcan Hello, and Battle at the Binary Stars. The first episode aired on broadcast CBS here in America, but the second, and all subsequent episodes, are available only on CBS All Access, an online, subscription-based service. Discovery is the service's flagship program, and CBS is counting on a large Trek audience to sign up. New episodes come out on Sundays. Discovery focuses on the Federation-Klingon war that paves the way for the groups' perpetual conflict throughout the rest of the series. On the Federation side, we start on the starship Shenzhou (apparently named after China's human spaceflight vehicle), which is severely damaged during the humans' first major battle with the Klingons. Soon, we'll end up on another ship: the Discovery. The lead character is Michael Burnham (Sonequa Martin-Green), whose parents were killed during an incident with the Klingons. She was raised on Vulcan by Sarek, Spock's father, and became the first human to attend the prestigious Vulcan Science Academy. In the opening episode, she's the first officer on the Shenzhou. The Klingon Empire we know from other Star Trek shows and movies does not yet exist. A leader named T'Kuvma (Chris Obi) believes he is the second coming of Kahless, the legendary Klingon warrior-God, and attempts to unite all Klingon houses under a single banner. While examining an ancient Klingon relic-ship in Federation space, Burnham accidentally kills a Klingon, and things go downhill from there. The incident gives T'Kuvma the excuse he needs to start a war with the Federation, and Burnham, seeing what's about to happen, tries to convince her captain, mentor and friend, Philippa Georgiou (Michelle Yeoh), to attack first. When Georgiou balks at the idea, Burnham goes rogue, using the Vulcan neck pinch to incapacitate Georgiou and take control of the Shenzhou. But it's too late; the Klingons attack, war breaks out, and in a final battle aboard the Klingon flagship, both Georgiou and T'Kuvma are killed. Burnham is sentenced to life in prison. I expected Discovery to be a cross between Enterprise and the new reboot movies. Instead, Discovery turned out to be something else entirely. It's definitely Star Trek, with all the wooden, technical, dialogue that is the franchise's staple. The producers also appear to have been inspired by the multitude of non-traditional shows now available from other production studios like Netflix, Amazon and Hulu. As a result, Discovery alternates between edgy and familiar, keeping the viewer off-balance just enough to create occasional jaw-dropping moments that come from good story flow rather than blinding special effects. The sets are beautiful. The candle-laden Klingon ship was rich and detailed, and the slow pacing of the Klingons' subtitled dialogue gives scenes added drama. The notion that the Federation is an assimilating, colonial force hiding behind a "we come in peace" mantra is a new angle, and T'Kuvma's rousing speech before the Klingons open fire is some top-notch Trek. Star Trek has always been comparatively diverse in its casting choices, and Discovery continues that trend by casting a woman of color as the lead character. Unfortunately, the writers have her quickly fall from grace. It was a fresh idea, but a little sloppy in execution. When Burnham neck-pinches her captain, it's hard not to cringe. I found it hard to believe that a starship commander—one raised on Vulcan, at that—would feel so strongly about her judgment to incite mutiny. Can you imagine Commander Riker knocking out Captain Picard? "That wouldn't happen," I remember mumbling to my wife, who was also watching. "And there would be huge consequences." In fact, the action did have consequences. Burnham is sentenced to life in prison (by an oddly shadowed tribunal of officers), and in previews for the rest of the series, it looks like she's going to have quite a struggle working her way back up through the ranks. There is precedent for this storyline: the Maquis officers in Star Trek Voyager. How Burnham's story plays out over the rest of the series will be interesting to watch. 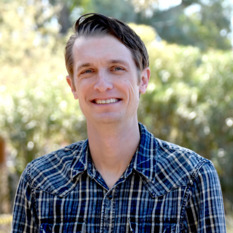 In an interview with Entertainment Weekly, Discovery showrunner Aaron Harberts said there are major parallels between the show and the current social and political divides in the United States. Racial purity, isolationism and ethics during wartime will all figure prominently. Star Trek has always tackled social and cultural issues, but with the exception of the later seasons of Deep Space Nine, it doesn't usually do so with war. Some of the most memorable scenes in Star Trek history involve diplomacy and brainy solutions rather than ships slugging it out on the front lines. That doesn't mean Discovery won't work, providing the writers focus on the bigger picture rather than jamming every episode full of starship battles. Deep Space Nine's treatment of the Dominion war was fantastic. Panic and suspicion from the changeling threat led to martial law on Earth. Kira's band of resistance fighters undermined the Dominion on occupied DS9. And the ongoing tension between Gul Dukat, Damar and Weyoun was fantastic, as the Cardassians began to realize they were second-class citizens under Dominion rule. Discovery's choice to explore Klingon politics is also a great idea. The Next Generation did a fantastic job on this front over the course of the show, focusing on Worf's struggles to reclaim his house's honor while raising a son. The two-part episode Redemption, involving the Klingon civil war, was particularly well done. I'm still confused as to why Discovery needed to be a prequel. Given the vast possibilities for modern TV shows and the richness of the post-Voyager Trek universe, why did the creators confine Discovery to a prequel that has to fit within the constraints of a particular timeline? Writer Nicholas Meyer (the legendary Wrath of Khan director) addressed this by saying creator Bryan Fuller (who has since left the show) "didn't want to use the same characters from other series." Yet we've already seen Spock's father Sarek, and from previews, it looks we'll meet storied con man Harry Mudd as well. Executive producer Brannon Braga also said going too far into the future risks pushing the limits of creating plausible technology designs. But as has been pointed out by numerous fans, some of the touchscreens and holograms look like they fit better at the end of the current Star Trek timeline. Did CBS think we wouldn't accept a bridge with physical buttons? Plenty of other shows serve up retro settings; I'm not sure why Discovery couldn't do the same. Ultimately, I can forgive these annoyances. TV shows are products of their time, and though I'm happy to wax poetic about the olden days of Star Trek, judging Discovery against its predecessors is only helpful to a certain extent. Too much nostalgia makes you closed-minded, and it's a slippery slope before you find yourself on the wrong end of a Ghostbusters casting argument. Kirk and Spock were great. Picard was great. Let Burnham and Discovery be great in their own way. My biggest hope is that Discovery introduces a new generation of fans to the wonders of spaceflight the way older Star Trek shows did for me. In a darkening world, Star Trek dares to promote a hopeful future where we humans put aside our differences to explore the cosmos. Great review, Jason. Live long and prosper, friend and colleague!